E. Phillips Oppenheim, an English novelist created well in excess of 100 novels and 30 plus collections of short stories. Most of his tales are thrillers and espionage. 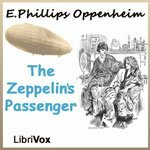 The Zeppelin’s Passenger is a tale of espionage in England during World War I. Dreymarsh is a fictional “backwater” area in England with no apparent military value. The story begins with Dreymarsh residents discovering an observation car from a German zeppelin along with a Homburg hat near Dreymarsh. The mystery is further complicated when an Englishman, Mr. Hamar Lessingham, presents himself at Mainsail Haul which is the residence of Sir Henry Cranston. Lessingham bears with him, hand-carried letters from Major Richard Halstead, and a British prisoner of war in Germany. He presents them to Halstead’s sister, Phillipa and Helen, Halstead’s fiancée who have had no word of Richard’s fate and are deeply concerned. Phillipa, Sir Henry’s wife, is smitten with Lessingham, after Sir Henry appears to her to be a coward since he will not become involved in the war effort. Lessingham appears to be the perfect gentlemen but he is not who he pretends to be. Eventually, Phillipa and Helen discover that the delivery of Halstead’s letters come with a price. All becomes clear near the end to discover the secret of Lessingham, Sir Henry, and Mainsail Haul.